Home » Author: "Credit Valley Conservation"
After a seemingly endless winter, Ontarians are desperate to get outside: to hear the sound of birds and spring peepers, to bask in sunshine streaming through the early foliage, to breathe the fresh air of the outdoors. 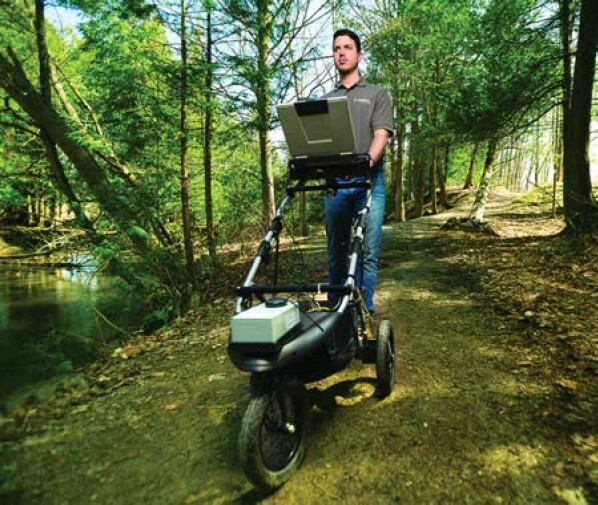 TRCA‘s Adam Dembe uses a High Efficiency Trail Assessment Process device to collect detailed data on conservation authority-managed trails to assess the accessibility of conservation trails. Photo by Shayne Gray. When Sandeep Niranjan wants to ground himself, he heads for the hills, forest or bluffs. “I fit outdoor meditation and yoga into my weekend. I feel like I’m far from the city because, in a single moment, just focusing on the sound of a bird or of trees cracking, puts me in the right mind frame, ” says the 18-year-old Forest Hills Collegiate student. For Niranjan, this outdoor time is a spiritual experience, not least of all because it connects him to his roots. “My grandfather lived by a tea plantation in Ooty, India, and he used to meditate outdoors too, ” says Niranjan, whose Grade 12 environmental studies class recently visited the Kortright Centre for Conservation, less than an hour north of Toronto, to study climate change. The class toured the trails and demonstration areas, including a model house exemplifying green design principles, and got their own healthy dosage of the outdoors. Experts call our nature craving biophilia, and say outdoor time is crucial to human health and quality of life, providing physical, mental and psychological benefits. According to the David Suzuki Foundation, regular green time can reduce the risk of a heart attack by 50 per cent and the risk of diabetes by 50 per cent. Studies also show contact with nature reduces anxiety, stress, depression and ADD/ADHD, while improving energy, immunity, Vitamin D production and weight loss (which is tied to boosting health). In fact, some doctors now prescribe a walk in nature to patients suffering from illnesses including cardiovascular conditions, high blood pressure, diabetes, depression and anxiety, says Mike Puddister, deputy CAO and director of watershed transformation with Credit Valley Conservation (CVC). “Interacting with nature changes our body chemistry, ” says Puddister, noting that conservation areas are as much about protecting human interests as they are about preserving wildlife habitat. Most GTA residents are a short drive, bike ride or walk from the natural areas that are so crucial to our health. Maintaining that access is crucial, say experts. With nearby nature, anyone can access a quiet place among the trees or along a shaded stream, without a big disruption to their day. That access is key, as health-care experts and conservationists urge parents to get their children playing outside. According to ParticipACTION, Canadian kids spend an average of seven hours and 48 minutes per day engaged in screen time. Fewer than 5 per cent get the 60-minutes per day of active physical time recommended by Canada’s Physical Activity Guidelines for Children and Youth. While screen time has been shown to increase sleep difficulties, anxiety, depression, weight gain and risk of developing attention-deficit disorders, daily physical activity such as outdoor play is associated with improved sleep, academic performance, self-esteem and lowered heart disease and type-2 diabetes risk. Children find nature play natural, says Burkhard Mausberg, director of Friends of the Greenbelt and father of three teenage girls. “Find activities you all enjoy. Getting outdoors should not be a guilt-driven exercise, ” he says. Make it less about: this is going to lower our blood pressure, and more about: this is going to be a crazy-fun time! “The choices we have in Ontario’s Greenbelt are mind-boggling, ” adds Mausberg, citing early-spring maple syrup and sugarbush festivals (Kortright Centre, Stouffville’s Bruce’s Mill Conservation Area, and Halton region’s Terra Cotta Conservation Area), rock climbing (Burlington’s Mount Nemo), cultural enrichment (Black Creek Pioneer Village), camping at Albion Hills, as well as provincewide learn-to-fish programs as just a few of the family-friendly options. As outdoor green-activity time becomes a doctor-sanctioned health recommendation, health and conservation organizations are working to improve access to Canadians who would benefit from regular doses of “Vitamin G” and the “green lift” it provides. Last year, the Canadian Mental Health Association (CMHA) partnered with Conservation Ontario and Hike Ontario in a pilot project called Mood Walks, training local mental-health agencies to take older adults aged 50-plus on guided nature walks. As an added bonus, says Mitchell, some Mood Walk groups volunteered on trail-maintenance projects, giving back to their community and boosting their own self-esteem. Last year, 22 walking groups were started. This year, Mood Walks is focusing on young adults, 16 through 25 – an age group that typically faces long wait times for psychiatric services, often weeks or months. If the well-documented benefits of nature time can “bridge the gap” and help them stay on track, says Mitchell, it will have a profound domino effect on their education, future careers, financial independence and adult lives. 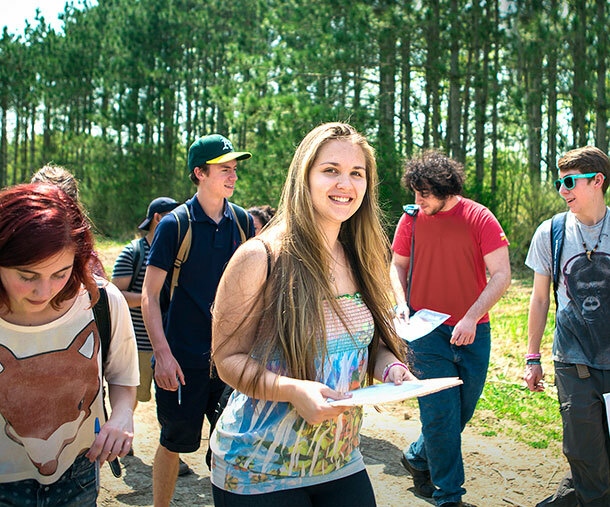 Another potentially life-changing initiative geared at young people is the CVC’s Conservation Youth Corps, a summer volunteer program for high school students, based in the Credit Valley watershed. Participants plant trees, work on stream restoration projects and manage invasive species, while gaining curriculum-mandated volunteer credits. Andrew Kett, the manager of education at CVC, says today’s conservation areas are becoming proactive about making health connections. “We’ve developed a health and wellness program that provides outdoor experiences to community health organizations and we’ve worked with diverse organizations in Mississauga and Brampton, like Extendicare Mississauga, the India Rainbow Community Services of Peel, and the ‘Sauga Stroke Breakers, which is a Mississauga-based therapy program for stroke survivors, ” says Kett. The ‘Stroke Breakers visit Terra Cotta Conservation Areas’ wheelchair-accessible trails for outdoor programming. That’s not to say the programs that eased many generations of Canadian kids into becoming outdoor lovers don’t still exist. 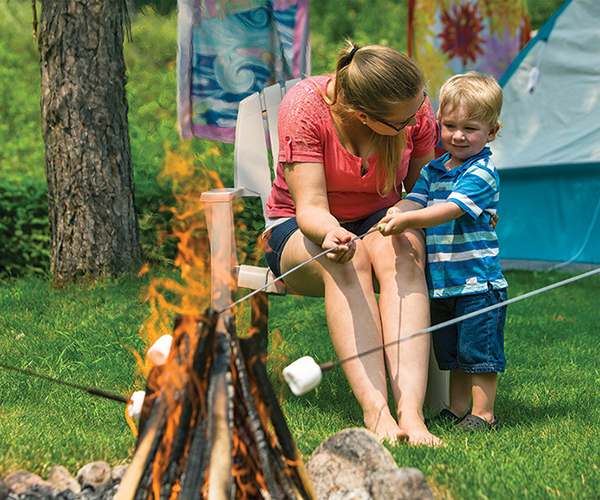 Check your local conservation authority websites for programs for all ages. Or, for unstructured tranquility, just head into the woods. As Niranjan has found, sometimes all it takes to ground yourself – to nature, to health and to tradition – is a few deep breaths under a tall tree. “If you take care of the environment, it will take care of you, ” says his classmate Bessie Cassidy, 18, noting Toronto’s many green spaces offer access for health-boosting green time. “We’re a part of nature itself, even if we forget that at times. We need it as much as it needs us. 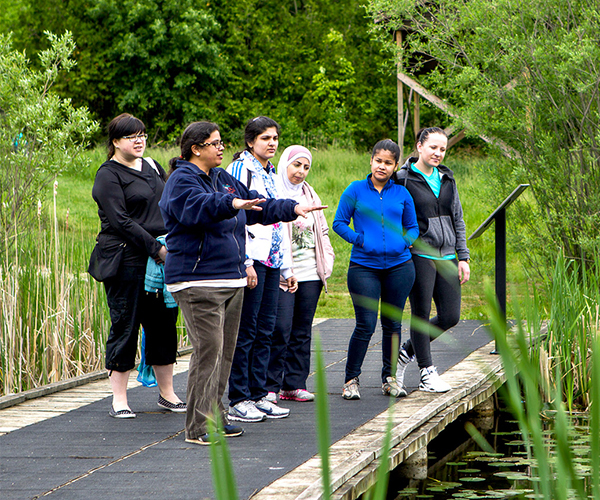 CVC’s Ashoo Anand, second from left, at the Terra Cotta Conservation Area with an ESL class from Mississauga’s Dixie Bloor Neighbourhood Centre. It took many years – and an international relocation – but Malarselvi Sethupany and Sethupathy Kuppusamy are finally fishing. The Mississauga couple, originally from Tamilnadu, India, had always been curious about the sport, but had never picked up a rod and reel. Since arriving in Canada last year, Sethupany, a former biotech research assistant, and her husband, Kuppusamy, a mechanical engineer, have been busy adjusting to life in Canada. Along with setting up their home, that means everything from looking for work and taking advanced English as a Second Language (ESL) classes, to getting their Indian professional designations recognized in Canada and helping their son, Sharath, with his Grade 3 homework. Consequently, learning to fish wasn’t exactly atop their priorities list. But when Sethupany’s ESL program offered the chance to learn to fish at Brampton’s Heart Lake Conservation Area, they took the bait. “When we heard about the Learn to Fish event, we said, ‘We must attend that! '” says Sethupany. It’s just one opportunity at conservation sites that’s open to new Canadians – an already large demographic that’s on the rise: approximately 30 per cent of Canadians speak a language other than English. The Greater Toronto Area (GTA) has been dubbed the most culturally and ethnically diverse region in all of Canada, with more than half of the population born outside of Canada. Yet newcomers are under-represented among conservation area visitors, and advocates say a lack of awareness and limited access are two of the biggest barriers. “The first thing that comes to mind when most newcomers think of Canada’s natural wonders, is Niagara Falls, not conservation areas,” says Ashoo Anand, multicultural outreach program Coordinator for Credit Valley Conservation (CVC). Recognition of these barriers led CVC and its counterpart, the Toronto Region Conservation Authority (TRCA) to create outreach programs that include organized activities at GTA conservation sites. In fact: the TRCA has been engaging new Canadians in environmental initiatives and stewardship projects since 1997 by reducing language, cultural and economic barriers. CVC’s multicultural program started in 2009. The Ministry of Natural Resources and Forestry-designed Learn to Fish program, which operates in conjunction with both the TRCA and CVC, is a fun, two-hour session that teaches aspiring anglers the essentials – not just how to fish, but how to do so in a sustainable manner. Students learn about fishing licenses, catch limits and proper catch-and-release techniques. 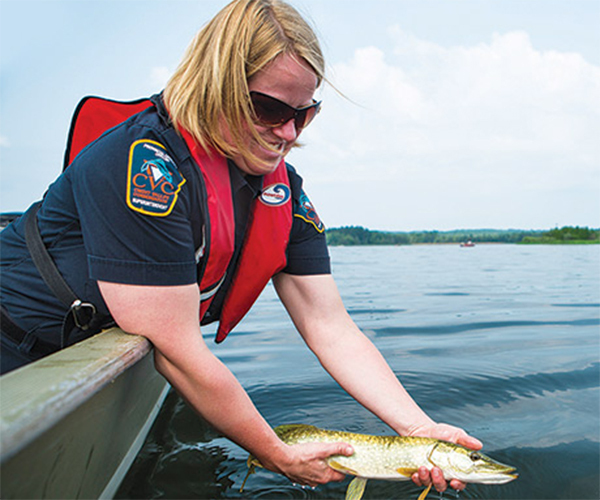 While the program has been offered to the general public for years – often during Ontario Family Fishing Week (July 4-12, 2015) – advocates identified a need to reach out to newcomers to Canada. The multicultural outreach program kicks off with a classroom session, so students know what to expect before their field trip, but also to raise awareness of conservation issues and culture. “We want to give participants the opportunity to value, protect and enjoy the green spaces throughout our region,” says Cherian, whether it’s as user-advocates, volunteers or, eventually, environmental professionals. Classmate Klaudia Pikulska agreed with the assessment, noting similarities between Terra Cotta Conservation Area and a national park she used to visit in her native Poland. “I used to go there every weekend. Now I’m so busy: I work, I go to school, and I have no time, but I need to start visiting again,” she said, planning to return with her family. Among the approximately 30 field trip participants were a handful of babies and toddlers. Terra Cotta Conservation Area is a particularly popular site for class trips because its trail network includes stroller-friendly routes. The vast majority of students at Dixie Bloor Neighbourhood Centre are women, many of whom are mothers, notes Anand. Ensuring access includes making accommodations for kids, with all-ages attractions such as maple syrup festivals (Kortright Centre for Conservation, Bruce’s Mill Conservation Area and Terra Cotta Conservation Area) and Learn To Fish. A trip to Black Creek Pioneer Village resonates with deeper meaning for many recent immigrants. One of the guided tour programs for ESL students called “Life in a New Land” gives participants the opportunity to learn about survival, how to build a community and how to cope with conditions in a new land. Back at Heart Lake, Malarselvi Sethupany was preparing to cast her first line. “Back home, I used to see the fish jump, and think ‘fishing would be nice to try.’ Now I will,” she said, smiling, as her husband and son stood nearby with their own borrowed rods. Eight-year-old Sarath, a fan of Discovery Channel nature shows – especially ones about fishing – was stoked, thinking about the rainbow trout, sunfish, catfish and bass lurking in the water’s depths. “When you fish, you could catch a lot of fish!” he said, excitedly, before turning away to face the lake. Becca McLellan and her son, Riley, 2, at Albion Hills Conservation Area, which provides a cottage-by-the-city experience with RV spots. Imagine having your own lakeside retreat, less than one hour from Toronto: a place where you can swim, fish, hike in the woods, and break out the mountain bikes for some trail riding – or, if you’re adventurous, sign up for an off-road bike race. Because you’re so close to the city, you can invite friends over for an alfresco dinner and, at the end of the night, stargaze while roasting marshmallows by the firepit. The best part: no, you didn’t have to win the lottery. As Toronto residents Judy and Harry Vandekemp discovered more than 20 years ago, Albion Hills Conservation Area provides this cottage-by-the-city experience with RV spots complete with an electrical hookup, at an affordable price to boot. Located in Caledon, the bustling Toronto Region Conservation Authority (TRCA) site, which saw a 30-per-cent increase in visits in 2014 over the previous year, has been their family’s summer home for 20 years. “We book a seasonal rental from May through October each year, and start off with a few days here and there, but for July and August, we basically move in,” says Judy, mom to five kids, ages 15 through 27. The proximity to Toronto means her husband can visit “the office” (Golden Crisp Fish & Chips, their west-end Toronto restaurant) without any disruption to their summer schedule. But the convenience doesn’t come at the cost of a cottage-country experience. “Once we’re in the park, even though we’re just 45 minutes north of Toronto, it feels like we could be in cottage country another three hours further north,” says Vandekemp. “We’ve got the same trees, the same kind of grounds. We may not have Georgian Bay, but the small lake and pool are great and it’s so peaceful and beautiful. You get that northern feel, but you’re still close to town,” therefore avoiding the bumper-to-bumper traffic that is the bane of Muskoka- and Kawartha-bound cottagers, she says. Traffic jams and rising costs are so synonymous with the summer vacation experience that many city dwellers are no longer willing to make long-haul treks, says Doug Miller, senior manager with the parks and culture division of the TRCA. “Staycationing is the trend we’re really noticing. Between traffic north, ever-rising fuel costs and the poor exchange rate if you head south, people are taking day trips or camping close to home,” says Miller. “Life in general is a factor; if you stay close to home, you can still make it out to your son or daughter’s lacrosse games or swim meet, and any other commitments.” For busy families that kind of accessibility is a game-changer. Increasing awareness of conservation site activities is also fuelling renewed interest in these local-wilderness destinations, which have adapted to changing times by retaining traditional elements such as fishing (Glen Haffy Conservation Area and Ken Willans Resource Management Area are particularly renowned for their family fishing), while introducing more contemporary pursuits: mountain biking trails (Albion Hills Conservation Area), BMX parks (Bruce’s Mill Conservation Area), splash pads and Treetop Trekking zip lines (Heart Lake Conservation Area). One-day events such as the Mud Hero adventure race and a variety of mountain bike races at Albion Hills are attracting scores of new visitors. “We’ve really looked at what people are looking for and have partnered with some wonderful groups to bring more activities into our facilities, so people can connect with nature,” says Miller, adding these new attractions are ammunition in the battle against sedentary, screen-focused lifestyles. “We all know the challenges of getting people off their screens, and we’re really striving to provide activities that will appeal to different groups to get people active and outdoors,” he explains. The appeal of conservation areas appears to be growing. For instance, in 2014 there were more than 75,000 visitors to Island Lake Conservation Area, the Credit Valley Conservation (CVC) site located 20 minutes away from Albion Hills. On a recent Sunday afternoon, Holden Blair, 5 1/2, of Brampton, was excitedly surveying the spring-fed lake at Island Lake Conservation Area. As his father, Kevin Blair, unloaded their canoe, Holden announced: “I’m here to go fishing. I want to catch a big bass fish, to win a trophy. That’s it!” he declared during a fishing derby being held at Island Lake that weekend. Nearby, another father-son pair was taking a shore break before heading back out on their boat. “It’s been really fun and the fishing has been good so far. We caught a bunch of perch and sunfish,” said Julian Sangiorgio, 13, who won the derby’s yellow perch category in 2013. Julian and his father, Rico, avid fishermen, were lured by the derby even though they typically spend their vacation time fishing in Italy. Although the derby was the star attraction that day, Island Lake hummed with activity, as families took advantage of the site’s shaded picnic areas, beach and rental canoes, kayaks and standup paddleboards to find respite from the July heat. Island Lake attracts summer crowds for its water-based activities, fishing and picnic areas, says Sandy Camplin, a conservation areas administrator for the CVC, but additional features will enhance the site’s traditional appeal. “We’re launching Art in the Park at a few of our parks. A local artist will come in and paint at each location, and we’ll host classes where she can teach you to paint, too. We’re offering that at Belfountain, Terra Cotta and Island Lake Conservation Areas this summer,” says Camplin. Another new initiative is yoga in the park, also being held at a variety of CVC conservation areas (check online for locations). But the biggest change at Island Lake was a community-led one. After nearly a decade of fundraising and years of construction, the local Friends of Island Lake volunteer committee is unveiling a 10-kilometre trail around the lake. The wheelchair-, stroller- and bike-accessible path will enable people to explore the varied terrain around the lake, and offers views of the wetlands, woods and maybe even native wildlife such as deer, foxes, beavers, and an osprey pair who are raising their young in a raised platform nest above the lake. Having this wilderness experience nearby is a huge boon for GTA residents, say conservation area enthusiasts. Besides saving on gas money and commuting time, conservation areas provide an accessible way for urbanites to dip their feet into the water. “Some first-time visitors may be nervous in the wilderness of a provincial park, but conservation areas have a staff presence, people to guide you and help you through a new experience, which is a good reason to visit on a day trip,” says Camplin. And who knows: it may just become a 20-year habit. After two decades of staycationing in Albion Hills, the Vandekemps have passed this tradition on to the next generation. Judy and Harry’s daughter, Becca, has booked an August weekend in one of the park’s rental trailers with her husband and kids.